Cody Havlicek, Texas Ranger, is a moral man. He is totally dedicated to enforcing the law and will do whatever it takes to bring wrongdoers to justice. When a series of murders, including that of a fellow Ranger, takes place in the Big Bend region, he is ordered to track down the men responsible. Cody and a young boy he rescued must face and defeat the diabolical criminals. The twisted confrontations and hardships along the way cause Cody to question his strong faith in God. He must oppose his own fear and find the strength needed to bring the killers to justice. Big Bend Death Trap is not so much a traditional Western as it is a mystery with a Western setting. As Cody will find out, the roots of the crimes he is investigating reach all the way back to the state capital in Austin, where the treachery of one man leaves the young Ranger literally on the brink of death. is exciting reading for nearly all ages. Since the 1960�s the western novel has drifted by the wayside along with western movies. Jim Griffin is revitalizing the western genre by bringing to life fictional characters interspersed with real life experiences in the same voice as Max Brand and Louis L�Amour. Jim creates a mixture of quality writing fueled by the desire to produce a work that cannot be put down until the last page is turned. No one writes traditional Westerns with more heart and passion than James J. Griffin. 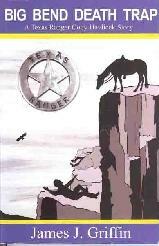 BIG BEND DEATH TRAP is an exciting, action-packed tale of Texas Ranger Cody Havlicek�s search for a diabolical killer. Western readers are sure to enjoy this one.